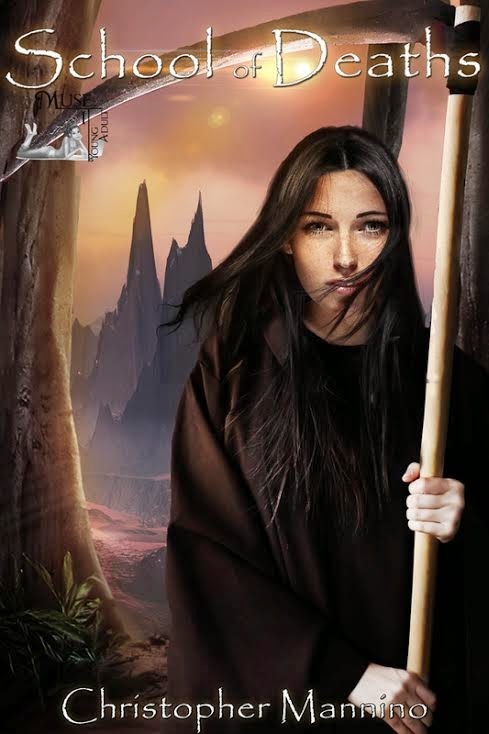 Today we're spotlighting School of Deaths by Christopher Mannino, a fantasy about the first female Grim Reaper in a long time. Make sure you check out the excerpt and trailer down below! “Can a timid girl find bravery as the first female Death? She wanted to scream but no sound came. She wanted to run, but her legs wouldn’t move. The hooded man grinned. Suzie’s heart pounded as she opened her eyes. Laughter echoed in the back of her head. The terrible laughter she heard every night. She wiped the sweat from her face, pushing aside the sheets. Sunlight spilled into her room from between frilly curtains. Mom would be knocking on the door to wake her soon. She turned to one side as the dream started to fade. Every night the same nightmare. Every night she heard the laughter. The hooded man with a scythe. The feeling of complete terror. Above her clock radio, a worn teddy bear stared at her with its single eye. She pulled the bear to her chest and clutched it with her bony fingers. Suzie Sarnio. The hooded man had written her name down. He always wrote it right before the laughter began. The man looked like Death. But why would Death have a stammer? Suzie changed, staring at the mirror in her pink-wallpapered room. Each rib stuck out from her chest; she counted all twenty-four. The skin on her face stretched tightly over her skeletal face, and dark patches surrounded each of her gray eyes. As much as she tried to comb it, her long black hair tangled into stringy knots. Her arms hung from her shoulders like twigs, and her legs looked too weak to hold her up. In the past few months, she had lost nearly half of her weight. She glanced at an old picture, taken last year, on the first day of seventh grade. A chubby, pigtailed girl with freckles smiled back at her from the photo. Her braces gleamed in the sun, only a month before their removal. Suzie sighed. She opened the door, looking for a moment at her room. She didn’t want to start another year of school. Slowly, she turned around. “Hey, squirt, watch out,” said Joe. “Sorry.” Joe was a pest and a bully, but he was her big brother, and Suzie supposed she loved him. Suzie stepped aside, watching the bulky frame of her brother lumber downstairs. “Later.” He winked at Suzie. “Have fun at school.” He ran out the front door, slamming it behind him, while Suzie went to the kitchen and sat down. “I’ve made you a special breakfast,” said her mother, carrying a plate and a glass of orange juice. Suzie gave up arguing. Her parents, friends, and doctors were wrong. She didn’t want to lose weight. Everyone kept talking about anorexia, about eating disorders. The strange thing was Suzie ate more than she ever had before. She ate twice as much as any of her friends, hardly exercised, and certainly never—what was the word the doctor had used—oh right, purged. Gross. No, the way Suzie ate, she figured she should be fat. Only she wasn’t. Suzie managed to eat most of the massive breakfast. Her stomach ached, but maybe a little would stay this time. She wiped her mouth, rubbing her fingers across the bones of her face. Doubtful. Suzie didn’t answer. What would her friends say? She’d spent the summer avoiding them, dropping out of camp and swim club. She was embarrassed. She honestly didn’t want to lose weight, and didn’t have an eating disorder, but she appeared skeletal. She brushed her teeth in silence, dragging her feet. She put on her backpack and got in the car. “I’m not sick, Mom. If I was sick, the doctors would cure me. If I had an eating problem, they’d work with me. I eat more than ever, and I hardly exercise anymore. This doesn’t make any sense.” Suzie wiped a tear from her eye. Bumper. The family beagle for ten years. He had died three months ago, about the time Suzie had started losing weight. Mom believed the two were connected. Dr. Fox agreed. Sure, Suzie missed Bumper, but that wasn’t the problem. She sighed. Mom still didn’t understand, and if Mom and Dad didn’t relate, her classmates would be even worse. They pulled up in front of school, and she gave her mom a quick peck on the cheek. “Don’t forget. One o’clock.” Mom smiled, trying to hide the strain in her eyes. “I’ve been sick,” said Suzie. Not a complete lie, obviously something was wrong with her, but she didn’t know what. “Crystaaal. Suzieee,” shouted a voice from across the parking lot. Suzie and her friend started to walk away, but the tall, lanky girl with small eyes caught up to them. Monica. She wasn’t too bad, if you ignored her whiny voice and her inane stories. Suzie realized the worst of the day was over. She got teasing looks from the kids and concerned frowns from the teachers, but like Monica, most people were too wrapped up in their own little world to pay any attention to her. Even Crystal eventually stopped asking questions. “I’m sorry, what?” she asked. Suzie snapped to attention. The day had blurred by, and she was sitting in Dr. Fox’s office, wearing a hospital gown. Suzie was cold and annoyed. The office smelled of bleach, and the fluorescent light overhead hummed like a dying fly. Dr. Fox glanced up from her notes and smiled a dry, lifeless smile she probably practiced in front of a mirror. “Yes, yes. I’m sorry I can’t do anything else for you.” Dr Fox sighed. None of them knows what’s wrong. To them I’m just another puzzle to solve. She dressed and gave Mom a smirk, turning up her lips on one side to show she was unhappy. Mom smiled and shrugged. “We’ll figure out what’s wrong, honey,” Mom said. They lied; no one knew. The next day was even worse. Now that the kids were starting to settle back into school, they had more time to notice her. Suzie rolled her eyes and sat at her desk. “Oooh.” The few who didn’t speak aloud were certainly thinking it. The whole class watched. Suzie’s face reddened as she got up and walked to the teacher. The whispers behind her grew louder. Couldn’t she have waited until after class? And on the second day of school. This was going to be a terrible year. Suzie didn’t even raise her head when the teacher started talking about books or maps or whatever. She sat at her desk, staring at her hands. Each bone poked through her tightly stretched skin. She counted nineteen bones in each hand, not counting her wrists. Disgusting. Finally, the bell rang for lunch. Mom had packed four sandwiches, three apples, two cans of soda, six bags of potato chips, and two candy bars. Overcompensating again, despite the doctor’s orders to feed her normally. Suzie ate one sandwich and an apple, putting the rest back in her bag. She sat in a corner, not talking to anyone, not even Crystal. She didn’t have the heart. After lunch, she had math, her least favorite subject. She walked up the stairwell and trudged into class. She sat down and felt a soft squish. A boy behind her started laughing. Suzie got up slowly, eyeing the gum he’d placed in her chair. She didn’t even tell the teacher. She stood; tearing the wad off her pants, then threw it on the floor and sank back into her seat, hiding her head in her hands. Suzie got up. Somehow, she had landed on the floor. She must have passed out. That was new; now the doctors would have even more to worry about. Suzie got her bag and followed Paul to the nurse’s. She had always liked Nurse Cherwell. She had rosy cheeks and always reminded Suzie of a massive gingerbread cookie. Her office smelled like peppermint. “Oh deary, deary, dear. What’s the matter with you, sweetheart?” Nurse Cherwell had a voice like gumdrops. Suzie had only been to the nurse’s office a few times before. Last year, they’d called her to tell her about Bumper. It had seemed surreal at the time, the year was winding down, and everything was going well. Then she found out her dog had died, and they told her in an office resembling a gingerbread house. “I fainted in class. Maybe I should go home.” Suzie didn’t need to go home, but why stay any longer at school? The kids were making fun of her, and she wasn’t in the mood for gingerbread. “Deary, my deary, sweet poor dumpling, oh my. I guess we’ll have to call your mommy and get you straight to beddy-bye, now won’t we, deary dear?” Nurse Cherwell smiled a huge smile full of marshmallow-white teeth and reached down to pinch Suzie’s cheek. Mom arrived soon after. She spoke to the nurse and gave Suzie a frown. “You have to take care of yourself, honey. It’s only the second day of school.” Mom sighed. For the first time, Suzie sensed how stressed her mother was. Mom wanted to understand what was wrong, but was helpless. She wiped a tear away, trying to hide it, but Suzie had seen. She reached up and gave Mom an enormous hug, wrapping her skeletal arms around her mother’s waist. Suzie gasped, remembering where she had seen the strange man. He was the one who opened the door looking out in the strange dream she kept having. Mom touched the blade of the scythe and drew her hand back in surprise. For more about School of Deaths check out these sites! Woah, this book sounds good! The premise sounds fantastic, and the excerpt was really interesting!